If you've ever had the opportunity to look inside a frog's mouth, you might have noticed some little teeth. Although frogs don't chew their food, their teeth indeed serve an important function -- one that is nothing like the primary function of human teeth. Frog teeth that are located on the roofs of their mouths are known as "vomerine teeth." The majority of frogs out there are equipped with teeth. Their tiny teeth are usually conical in form. They don't need to use their teeth for chewing because they swallow things in single pieces. Frogs, for the most part, don't employ their teeth for self-protection, so biting isn't usually a big concern. Frogs generally only have teeth on their upper jaws and on the roofs of their mouths. Gunther's marsupial frogs (Gastrotheca guentheri) are the only ones with teeth on the bottom. The function of the vomerine teeth is prey-oriented, specifically to grip onto food in conjunction with their tongues. 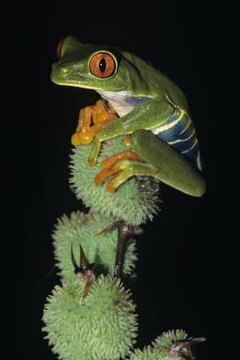 Frogs' tongues and vomerine teeth operate as a team to stop prey animals from being able to flee. The vomerine teeth are notably pointy and appear in pairs of tiny clusters on their mouths' roofs. The mucous membranes conceal the vomerine teeth, but not in their entirety. Frogs also have maxillary teeth on the top parts of their jaws. These teeth cannot be seen from the outside of frogs' mouths. As far as outline and size go, maxillary teeth are all pretty similar to one another. Like the vomerine teeth, the maxillary teeth also serve to keep prey under control until frogs are ready to tuck in and eat, which usually happens pretty swiftly. Although toads are technically part of the frog world, they have a couple of prominent differences. Toads typically reside on terra firma rather than in or near the water, for starters. They also are full of warts and don't have any teeth at all, vomerine or otherwise. Frogs' teeth differ from those of humans in many ways, not only in what they look like and what they do, but in how impermanent they are. Humans switch out their teeth merely once during childhood, but frogs actually regularly lose theirs, only for new ones to follow. This happens as long as frogs are alive. What Kind of Frog Eats Snails?